Turkey jailed more journalists than any other country in 2013, the second year in a row that the NATO member has outpaced China and Iran, a new prison census says. The New York-based Committee to Protect Journalists says Turkey had 40 journalists in prison as of Dec. 1, accounting for almost 20 per cent of all reporters jailed worldwide. "As a NATO member and a regional leader, Turkey should not belong in the list of top press jailers," the non-profit's Nina Ognianova wrote in an analysis. 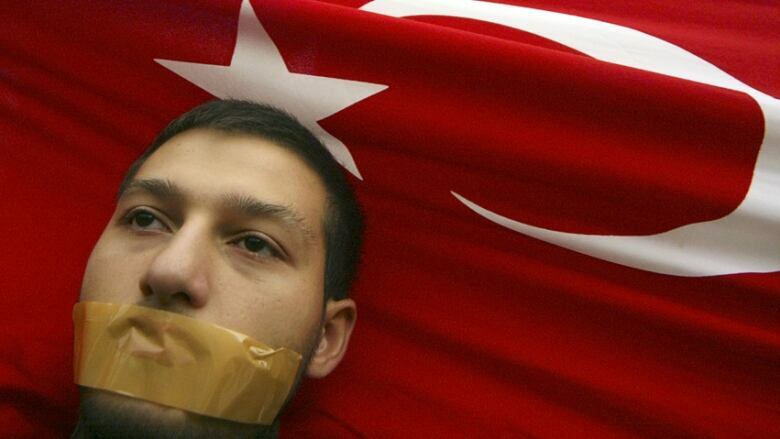 "But from the failure to reform its legislation in a meaningful way to the crackdown on its journalists in the aftermath of the Gezi Park protests, Turkey has grown increasingly repressive despite the modest decline in the number of media workers behind bars." Two CBC News reporters were among the journalists who had a brush with the Turkish prison system this year, though their stay was brief. In June, Sasa Petricic and Derek Stoffel were picked up by police while covering ongoing anti-government protests in Istanbul's Taksim Square. The pair were in a holding cell for several hours, then released thanks in part to some behind-the-scenes work by Foreign Affairs Minister John Baird and Turkish ambassador to Canada Tuncy Babali. The report only counts people currently imprisoned, so Petricic and Stoffel are not included in those numbers. In all, 211 journalists are jailed in 30 countries. The Committee to Protect Journalists said 2013 marks the second-highest number of journalists jailed worldwide since numbers have been tracked, behind 2012, when 232 journalists were imprisoned. The majority of journalists are jailed on anti-state charges such as subversion or terrorism, well ahead of charges such as defamation or insult. "In 45 cases, no charges were disclosed at all," the committee's editorial director, Elana Beiser, reported. Journalists who disappear or abducted by criminals or militants are not counted in the report. Online journalists accounted for about half of the prisoners at 106, while roughly one-third were freelancers. The committee said the number of jailed journalists in Iran fell to 35 from 45. It said some sentences expired and the government kept up its policy of releasing some prisoners on furlough. Those who are released do not know when or if they will be summoned back to jail. Authorities also continued to make new arrests and to condemn minority and reformist journalists to lengthy prison sentences despite the election in June of a new president, Hassan Rouhani, who has called for human rights reforms. In China, 32 reporters, editors, and bloggers were imprisoned, the same number as in 2012. Meanwhile, only one journalist was behind bars in the Americas. Roger Shuler, an independent blogger who writes about alleged Republican corruption in Alabama, was being held on contempt of court for refusing to comply with an injunction regarding content ruled defamatory, the CPJ said. In recent years, journalist jailings in the Americas have become increasingly rare, with one Cuban documented in prison in 2012 and none throughout the region in 2011.